The building which held the former National Museum of Surveying, located at 521 E. Washington St. The City of Springfield wants $425,000 in TIF money to buy an empty building downtown. It previously gave $118,000 in TIF to help renovate the same building in 2008. The current proposal would raise the city’s use of TIF funds for the building to $543,000, and it’s unclear whether further funds would be needed to prepare the building for tenants. 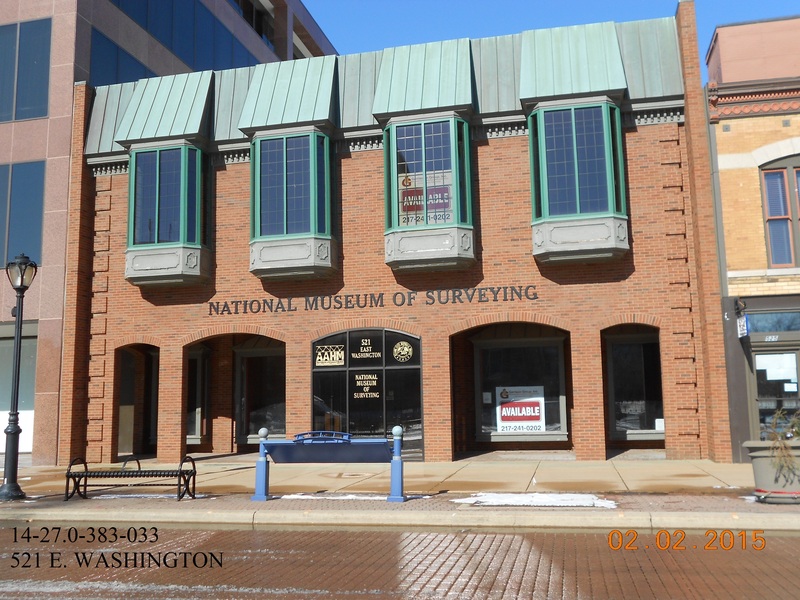 On Tuesday, Springfield mayor Jim Langfelder asked the Springfield Economic Development Commission to review his proposal to use $425,000 in downtown TIF funds for the purchase of the former National Museum of Surveying at 521 E. Washington St. If the plan is approved by the city council, the building would house the headquarters of the Springfield NAACP, a Springfield police officer, a cable access production space and an office for the University of Illinois Springfield. The building previously housed the National Museum of Surveying, which closed due to financial trouble in 2013. In April 2008, more than two years before the museum opened and eight months before its organizers even purchased the building, the administration of late mayor Tim Davlin gave the museum $118,000 in TIF funds. The money was to help renovate the building and purchase an easement allowing the city to preserve the building’s façade. Robert Church of Springfield was one of two people who spearheaded the museum’s move from an earlier location in Lansing, Michigan. In January 2009, Church and David Ingram, a surveyor from Mt. Crawford, Virginia, borrowed $1.4 million from Bank and Trust Company in Litchfield to establish the museum in Springfield. The $1.4 million in loans went toward purchasing and renovating the building, including installation of a new elevator for $72,350 and installing an interactive “Science on a Sphere” exhibit which cost $275,000. The museum opened in September 2010, but it was already in financial trouble as early as April of that year, when Bank and Trust allowed Church and the museum to extend the loan payoff date and borrow up to an additional $103,000 to satisfy liens placed on the building by unpaid contractors. Ingram resigned from the museum and refused to sign for the extra borrowing. Reached by phone, Church now says the museum was doomed from the start because of the recession – which he says led to fewer working surveyors and less interest in surveying – as well as a lack of support from state surveying associations and the construction industry in Springfield. “We opened it at the exact worst time,” Church said. The museum closed in January 2013, and Bank and Trust sued the museum and Ingram in May 2013 for repayment of the loans. The bank didn’t sue Church personally, but Ingram later filed a complaint in court alleging that Church wasn’t paying his share of the debt. Church says it was Ingram who wasn’t paying his share. Church was represented in that lawsuit by James Zerkle, a Springfield attorney in private practice at the time. Church worked as a top aide under former mayor Ossie Langfelder, the current mayor’s father, and Zerkle served as the elder Langfelder’s corporation counsel. When current mayor Jim Langfelder took office in 2015, he hired Zerkle to return as the city’s lead attorney. The lawsuit was ultimately dismissed by stipulation in October 2013, but the court record doesn’t include the terms of the stipulation. Bank and Trust foreclosed on the property, taking possession of the building for $630,000 in a sheriff’s sale in September 2013. That left nearly $887,000 in outstanding debt. Church says he has paid his share. Bank and Trust has tried to sell the building since foreclosing, originally listing it for sale at $1.15 million. The price dropped to $695,000 in early 2014, then again to $499,000 in July of that year. It was most recently listed at $490,000 in January 2016. Langfelder asked the Springfield Economic Development Commission on Tuesday to review his request for $425,000 to purchase the building. Some members of the commission questioned the city’s standards for its own projects in comparison to standards it applies to outside developers. Commission members also questioned the use of TIF funds to essentially remove a downtown building from the property tax rolls. The city has a separate TIF request pending for $4.5 million to repair the parking garage it owns and shares with the Wyndham Springfield City Center hotel. The garage needs repairs, but it doesn’t produce property tax revenue because it’s owned by the city. The Economic Development Commission previously approved $3.2 million for the project in September 2015, but Langfelder said the project had to be rebid, increasing the cost to between $4.4 million and $4.5 million. Langfelder said having the former museum building occupied would increase foot traffic downtown, in addition to the main goal of furthering the city’s efforts at race relations. Although the commission’s approval is only advisory, the result of the group’s vote on Tuesday has been contested by some members. Commission chairman Michael Pittman conducted a voice vote during the meeting and concluded that the motion to recommend the project to the Springfield City Council had been approved. After the meeting, however, three members stated via email that they intended their votes to be no. A fourth member, Springfield developer William Furling III, told a reporter that he didn’t voice his vote because of unanswered questions he had about the project. Furling said he didn’t intend for his abstention to be counted as a yes, but Langfelder wrote in an email to commission members that silence on a vote is affirmation. Furling said he’ll likely address the Springfield City Council when the issue comes up at a future meeting. The Springfield City Council has the final say in awarding TIF funds. The council’s Committee of the Whole briefly discussed the project at its meeting Tuesday night, and the full council may consider the city’s request in the coming weeks. Disclosure: Springfield Business Journal associate publisher Michelle Ownbey is a member of the Springfield Economic Development Commission.